For the best sod installation in Apex, Cary, Carrboro, Chapel Hill, Durham, Hillsborough, Morrisville and the West Raleigh area call Pleasant Green Grass. We have been providing professional sod installation services since 2006. Sometimes aeration and seeding are just not enough to get a good stand of turf established. If the soil is in really poor condition there will be a ton of weed growth. If there are more weeds then grass then organic lawn treatments are not enough and your lawn is in need of an aggressive plan. Weeds are indicators of poor soil health. If you have more weeds than grass then your soil needs a lot of help. Starting an organic fertilization & weed control program will help, but progress will be really slow. Fertilization programs are designed to improve and keep established grass healthy. To get healthy grass you have improve the soil. The best way to improve the soil is to till in compost. We till under the existing vegetation and soil with a roto-tiller, then we rake out the unwanted plant debris. Next we spread a thick layer of compost over the entire lawn area. Then we till that compost into the soil. This mixes the compost into the existing native soil adding literally tons of much needed organic matter. Then we smooth out the surface and lay the sod. Next we roll the sod to make sure there is good sod to soil contact. If you don’t have an irrigation system we will set up a temporary one for you with timers and multiple sprinkler heads so all you have to do it watch your new grow. There are advantages to both sod and seed. Sod is fast. In as little as one day you can have a new lawn. Warm season turf, such as zoysia and Bermuda are best established by sod. Seeding is not as fast, but the grass is stronger when it comes up because it’s never been transplanted from one growing spot to the next. Seed is also a bit more economical. Some grass types such as shady fescue blends are not available in sod. Nature’s Air Conditioner: Another benefit that everyone enjoys, usually without notice, is turfgrass’ tremendous cooling effect. Watered when the grass plant needs it, turfgrass will efficiently and effectively use almost every drop. A Natural Filter: Runoff water in urban areas carries many pollutants. Turfgrass acts as a natural filter, reducing pollution by purifying the water passing through its root zone. Soil Erosion: The clean gentle strength of turfgrass is the most cost-effective method for controlling wind and water erosion. Fun & Games: The soft resilient surface of turfgrass is the safest and least expensive place to play. Our Mental Health: Turfgrass quietly adds to the beauty of our lives and even our mental and physical health. Turfgrass . . . a continuing source of oxygen and cool air.. . . a cleansing answer to our environment.. . . a source of beauty and comfort. Ready to get new sod installed at your property or just have questions and need a quote? Give Pleasant Green Grass a call at 919-357-8245 today. 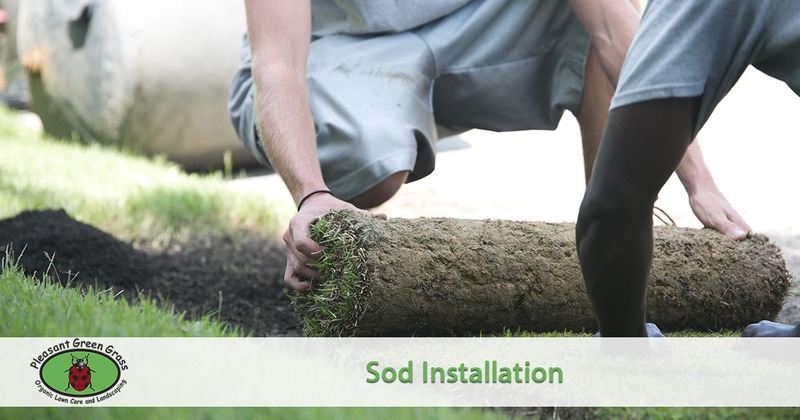 We will provide you a free quote and make scheduling your sod installation easy.